The ROI of change management, then, is based on the additional value delivered by a project as a result of employee adoption and usage. This tutorial presents the first two steps in the CMROI process with data about how practitioners are working to make the connection and quantify the dependency. The first step toward demonstrating Change Management ROI (CMROI) is to connect the people side of change to the ultimate results, outcomes, value and benefit of the change. Six Sigma is applied to reduce the variation of particular business process. The benefit of the undertaking depends on the employees who execute the process actually adopting it. An Enterprise Resource Planning application is installed to improve the integrity and access of data across an organization. The benefit of the system depends on employees entering data correctly and knowing how to extract the data they need. A hospital is implementing Electronic Health Records to improve record management and patient well-being. Record management and patient well-being will only be improved if doctors, nurses and administrators proficiently use the system. 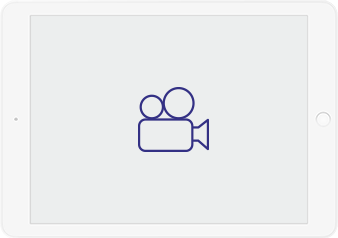 Thinking about a project you are working on right now, can you directly connect the people side of change to the results, outcomes, value and benefits of one of your projects? 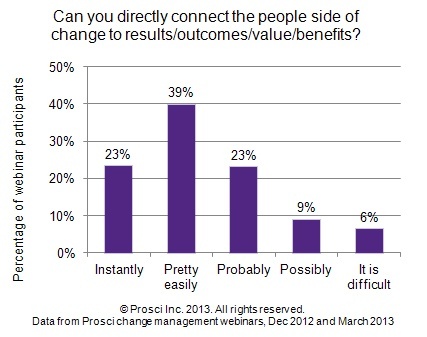 Attendees on recent Prosci webinars responded to the question: “Can you directly connect the people side of change to results, outcomes, value and benefits?” Overwhelmingly, webinar attendees said that making the connection was not difficult. In fact, nearly one-quarter said they could do it instantly and another 39% said they could do it pretty easily. This is the first step of the CMROI Model: making the connection between project outcomes and the people side of change. 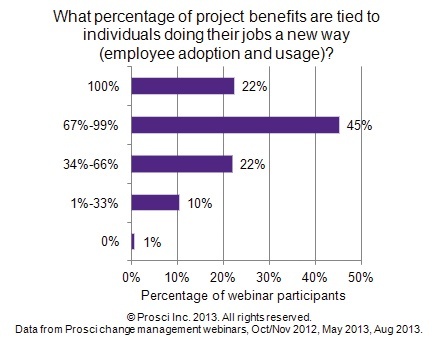 The data below comes from webinar attendees in recent Prosci sessions about the value of change management. The data is compelling. 22% said that all of the project benefits (100%) were tied to individuals doing their jobs a new way. An additional 45% said that over two thirds of project benefits depended on employee adoption and usage. For most changes, especially those happening in today's environment, a significant portion of benefits depend on adoption and usage. For your project, what percentage of project benefits is tied to individuals doing their jobs a new way (employee adoption and usage of the solution)? The first two steps in shifting the CMROI conversation toward the contribution of adoption and usage to project benefits is making the connection and quantifying the dependency. Using the prompts here, you can begin to shift the conversation.